Affiliate marketing is big business and it is poised to grow to $4.5 billion by 2016! While affiliate marketing is growing and evolving, the best practices for this channel seem to be outdated and causing stagnating campaigns, weak affiliate relationships, and status quo sales metrics. As such, Impact Radius put together 10 new performance marketing best practices that will keep your affiliate program manageable, targeted, and profitable. Stay ahead of the pack with a new perspective on affiliate marketing. 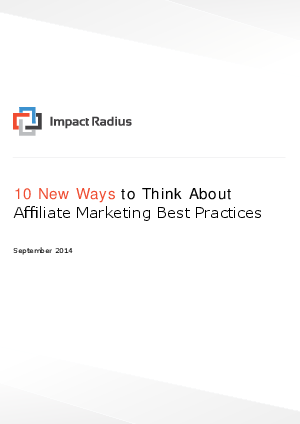 Download this new Impact Radius Whitepaper and dive into the 10 best practices based on deep understanding of your goals as an advertiser!